For the same reason I’m not a fan of actors like Jack Nicholson, Robert De Niro and Jim Carrey (because they only play one type of part), I do enjoy the films of Arnold Schwarzenegger for the action, fantasy violence and humour. Here Mr Muscles has been cast very much against type. The closest he comes to action in Maggie is a brief scuffle with a police deputy, and the obligatory shooting of a neighbour and his child when, infected, they try to attack him. Even then his character is immensely sad, rather than adopting the blasé attitude of his other well-known film characters. The entire movie is purposefully low-key. Schwarzenegger spends most of it looking upset or staring into space, which is probably what most of us would do, presented with the same situation. Unfortunately, all of this waiting around for the inevitable causes this film to fail when it has already succeeded. Everything is portrayed for maximum emotion: Maggie goes to a party and later sees a boyfriend turn, we hear about the human cattle-like conditions in quarantine, we witness the useless wrath of the neighbour who has experienced what they are going through, and we live with the daily degradation of Maggie’s body and the frighteningly heightened sense of smell. Abigail Breslin plays Maggie with just the right degree of understatement. You really do feel for her character. It’s a lovely little movie which dares to do something new with the zombie horror sub-culture. However, it’s all so painfully slow that you just itch to run the film forward to an event of significance. Even I had to endure the running time of 95 minutes in three sittings. However, afterwards I could appreciate just what British director Henry Hobson has achieved here. This movie has heart, if not staying power. 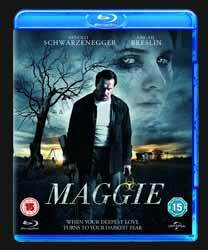 Extras include deleted scenes, Making Maggie documentary, director’s commentary, director interview, and Arnold Schwarzenegger enthusiastically repeats himself over and over in an 18 minute interview.